From a collection of early home- recordings with readings from foreign language-learning course books. 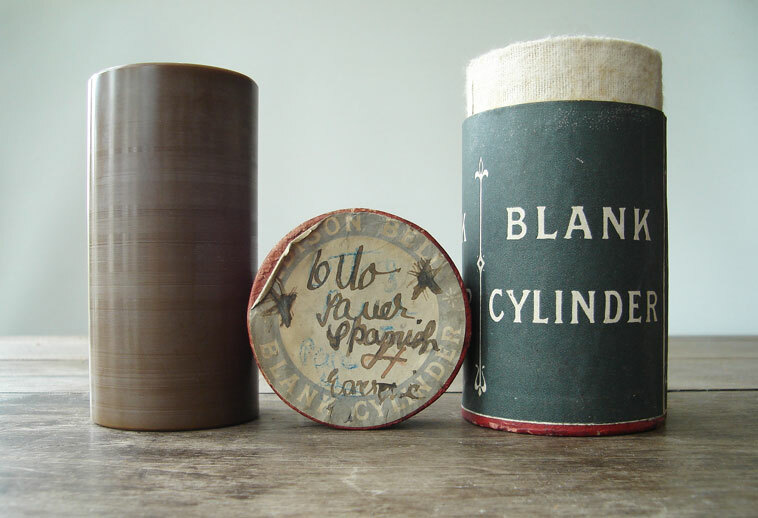 The record has been made by a native speaker and it’s my guess that this one-of-a-kind cylinder was made especially to accompany the book by a private tutor, before the commercial duplication and production of language cylinders. This cylinder contains an epicurean list from Karl Marquard Sauer ‘s “Spanish Conversation-Grammar”, published in 1900. Olives; sardines; radishes; oysters; marinated tuna; anchovies; ox; goat; lamb; beefsteak (rare or well done); pork loin; chops; lamb’s head; kidneys; sweetbreads; gizzards and other delicacies. In 1877, after inventing the tinfoil phonograph, Thomas Edison envisioned that the primary uses for sound recording and reproduction would be for language learning and business dictation purposes, rather than for entertainment.